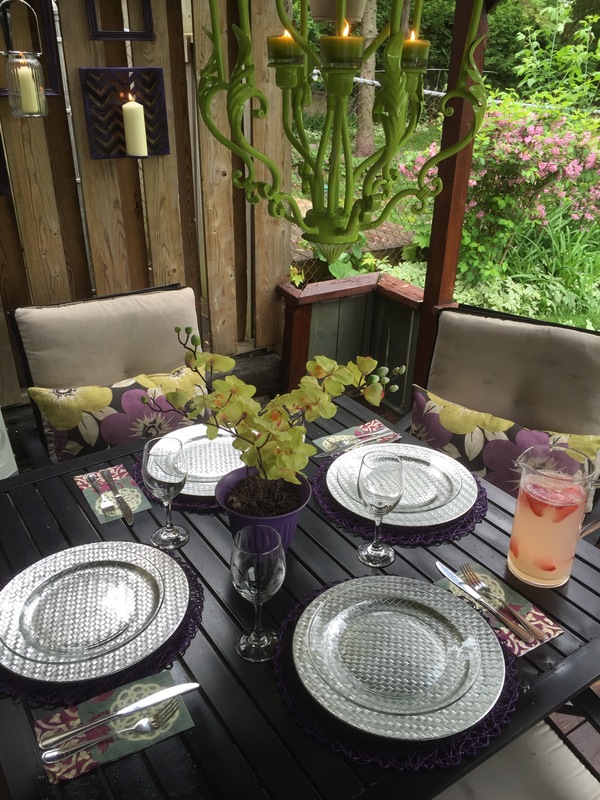 I’ve been working away at fininshing up my Outdoor Space for the #30dayflip challenge, hosted by Jeanette from Snazzy Little Things and Meredith from Arts and Classy, and today is the due day. Lol. Nothing quite like leaving it to the last minute right? 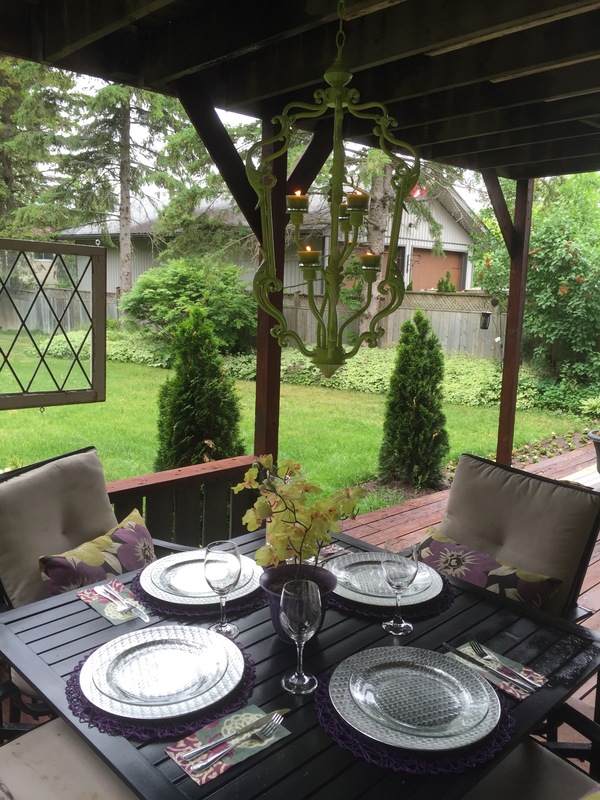 Here is my completed outdoor dining area. The colour scheme was inspired by the purple and lime in the outdoor cushions. When my husband walked out and saw it, his first comment was about how much The Hulk would like it based on my green and purple colour choices. Lol. While pleasing The Hulk wasn’t my intention, I did set out to try to create a fun space, which would work well during the day as well as into the late evening. But let’s check out a Before pic. Yikes, right? This was taken before we moved in. Here is the After. 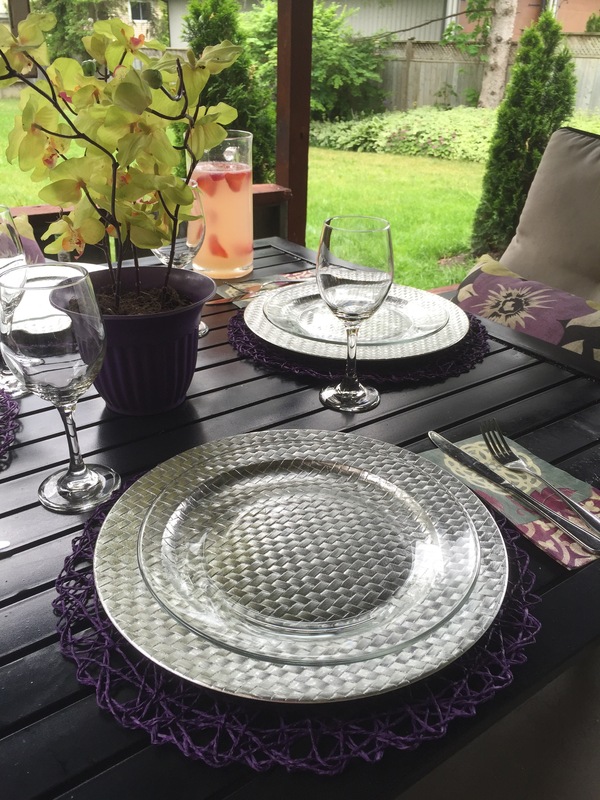 We figured the raised part of the deck was perfect for a dining area. The lighting was put together to create a warm glow once the sun goes down. With the chandelier and the candles on the gallery wall, there is more than enough light to carry the party into the night. The place settings are simple and complement the overall scheme. Looking out into the yard, I installed a leaded glass window with picture wire and eye hooks. The window helps fill in the large space, and I hope to add some hanging cone planters soon. The simple place setting helps welcome guests to this cozy space. My favourite part of the space is the gallery wall. I put this together using old frames I no longer needed, and some chevron candle holders. The hanging jar lanterns were purchased at the dollar store. 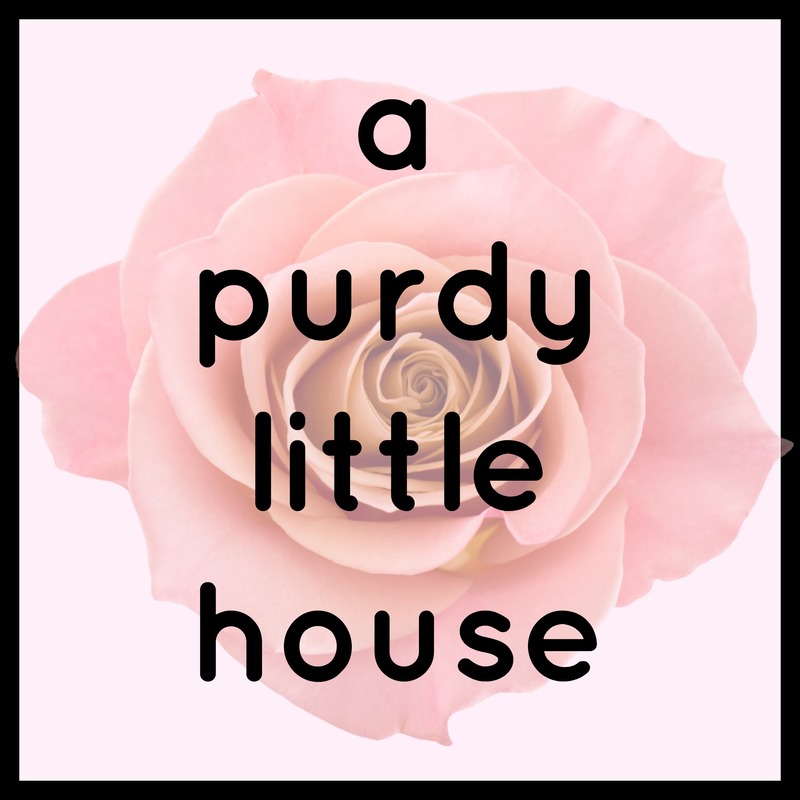 I had a lot of fun making this space a little more liveable, and thank you so much for checking out my blog. I’ll be participating in the #30dayflip challenge every month until the end of the year. 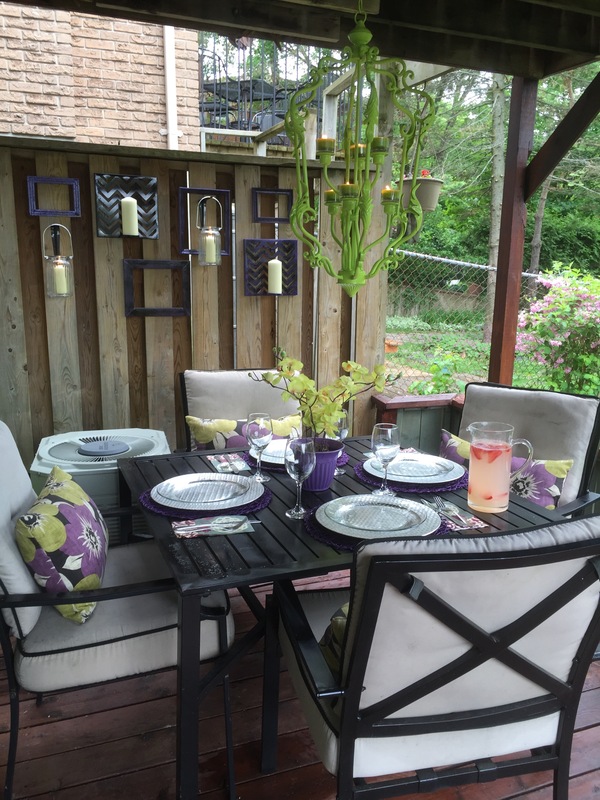 Click on the photo above to see the May 30DayFlip challenge updates, and connect to other bloggers and DIYers photos to see what they’ve been working on. Or by subscribing by email on the upper right hand side. When you subscribe by email, you’ll receive an email notification whenever a new post is published. Gorgeous! I’m in love with that lime green and purple flower fabric. Do you happen to know the maker so I can search for some for myself? Also, what color did you spray paint your chandelier? Love it! Hi Wendy. Thanks so much for your sweet comment ???? The spray paint for the chandelier is called Key Lime from Rustoleum. The fabric is from the outdoor collection at Fabricland, which is the Canadian go-to store for fabric. Are you in Canada? I’m actually going to be going to Fabricland within the next week or two to search for more outdoor fabrics to recover my outdoor couch with, so I will make sure to get the exact name of the fabric for you when I go, and I’ll post it here. Sound good? I even asked a staff member and showed her a picture. She said they have discontinued that line. Boo!!!! I’ll keep my eyes peeled though if I ever see it again online or in another fabric store, and I’ll be sure to let you know the name of it.